24 cm xviii, 363 p. : ill. This is an outstanding collection of twenty-six articles on key films of Japanese cinema, from the silent era to the present day that presents a comprehensive introduction to Japanese cinema history and Japanese culture and society. Studying films such as "Seven Samurai" and "In the Realm of the Senses", to "Godzilla", the "Ring" and "Tampoo", "Japanese Cinema" studies all the major directors of Japanese cinema including Ozu, Kurosawa, Kitano and Itami. Each chapter discusses the film in relation to aesthetic, industrial or critical issues, and each ends with a guide to further reading and a complete filmography for each director. 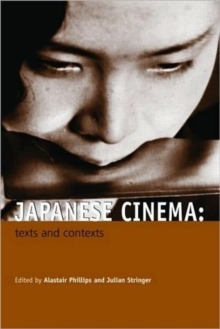 For students of Japanese cinema, this will be an invaluable addition to their reading.